Ring network topology ensures the reliability of the connections among all the switches in the network. 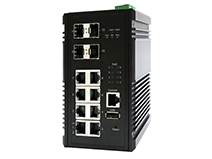 IGP-8804M2 supports ERPSv2 with easy to set up user interface, which allows it to recover from network disconnection in less than 20ms with 250 IGP-8804M2s connected in a ring network topology while transmitting/receiving data at full network speed. Also, IGP-8804M2 supports multiple ERPS instances, allowing different VLANs have their own ERPS instances. IGP-8804M2 comes with a USB port for connecting a USB storage device to the industrial switch. Configuration files, switch system log and firmware can be stored in the USB storage device for the switch to access. When a USB storage device is connected to IGP-8804M2, it will load the configuration file in the storage device and apply all the settings, saving on-site installation time and effort.